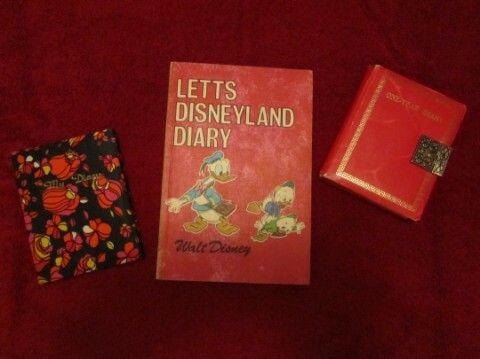 I kept a journal or diary starting when I was 7 years old and continued for about 30 years! I have actually gone back and read my childhood and teen diaries many times over. After that, I tend to avoid them because of painful memories – which isn’t really fair because I had loads of good times too. I just got my angst out in writing, so the journals make everything sound worse than it was! Sophisticated diaries from age 7! After I stopped keeping a journal, I started keeping day books full of lists and accomplishments (or lack thereof), and mementos of events, such as concert and movie tickets. 1 box of childhood photos taken by me and not by my mom, given to me by friends, etc. I also have about 35 photo albums from pre-digital days! You would think I must live in the past. I don’t think it’s true. I think my stuff accumulated for psychological reasons. My adult life had been unsettled and I liked the feeling of being able to pore over my personal history, write out my feelings, and move forward again. And she lived out the rest of her days. Especially to anyone out there who blogs – how would you feel about an undocumented life? You should transcribe those diaries/journals into a book form; maybe to be published some day??? Isn’t that true – I only ‘journal’ for want of a better word, when i feel like rubbish… So rereading is always doom and gloom. I also journal when i’m in ‘luv’ which is tortured, but good, and wondering… so that’s interesting to look back on! Oh I have two stamp albums, on my shelf. Can’t part with them, but seldom touch them… Always look at them thinking, should they stay? I justify my stuff by saying it’s all organized and I do have the space for it! Please don’t discard anything!!! Archivists are already concerned with the fact that due to the prevalence of blogs and email starting in the 90’s and definitely carrying forward, we’re going to be hard pressed to preserve social history in the way that we’re able to for the 19th & early 20th century! I can guarantee that your “stuff” *will be* wanted when you’re ready to part with it!! Funny you should say that; I was thinking there might be some value in having someone’s ordinary everyday experience documented. Funnily enough me and my daughter who is 32 were Googling last night to find Aussie relatives on the internet and when I couldn’t remember all the names I suggested she went upstairs and retrieved Grannies box (granny not in it by the way – just old letters, newspaper cuttings, grandads memoirs, that he wrote in retirement before he passed away, and other bits and pieces). We found old yearly updates that come with Christmas cards and letters I had written to granny before she had to go and live in a care home. My daughter remarked that it was good to read them and remember what everyone was doing and learn about distant family members but she also said there wouldn’t be anymore like this from this generation as no one writes letters now and personal emails are not accessible and hardly ever printed out. I think this is very sad and I will make an effort to keep on writing as I always keep a journal, write occasional letters and still send postcards to keep those alive. Don’t forget though that we may be able to read peoples old blogs in the future as there are online places where you can print them as a book. Love your blog by the way – will come back for a more in depth read when I have a minute – sounds like we have papers and treasures in common – I am sure we will be able to swap notes!! Thanks so much for stopping by. Yes, letter-writing is a dying/dead art. I have a couple of friends who write me letters at Christmas (real hand-written ones) and I am always so excited to get them. I try to write a few as well. That would be a good goal/resolution. Cheers!